And just like that... he's one! If he wasn't sitting in front of me, then I'm not sure I would believe it. Over the past month, I have watched as he's gone from being a baby to a toddler - he's so big and robust now, and when I think back to what a tiny, delicate scrap of a thing he was this time last year, my heart feels like it might split in two. I know every mother thinks this about their own child, but I'm pretty sure that Benjamin is the greatest human who has ever lived. I'm not sure there could be a more perfect baby. We are mostly set in the decision that we are 'one and done' so I have been trying to savour this baby stage even more than perhaps I would have, knowing I might never do it again. 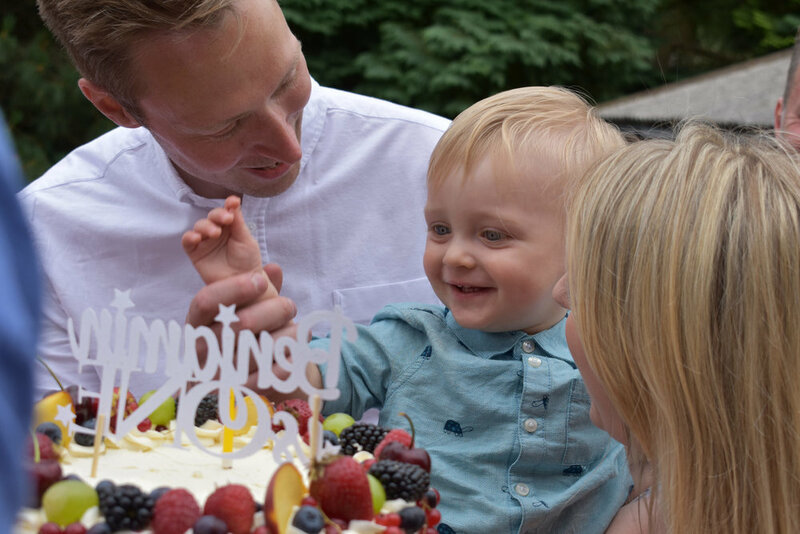 There are some bits that I will not miss, like sterilising a million bottles and changing a million nappies, but for the most part, it has been a very sweet experience being Benjamin's mother, and that is so much down to him. He has been so chilled out from the beginning, and although his mischievous side is starting to come out now that he's really on the move (oh boy, it will not be long before he is walking), he still has the most pleasant nature. He is often happy to just stand and open and close his toybox for ages as I sit and knit and watch him. He will sit and 'read' books on his own, and for the first time ever has started to 'watch' cartoons with us when he is sleepy and needing a break. It was my greatest joy to pick him up from nursery last week and have them tell me how smiley and happy he had been, and how they were so in love with this giggly, playful little boy. I feel like they are finally seeing the Benjamin that I see, and it warms my heart. He is always so quick with his smiles and laughter at home, going into hysterics at the silliest of things and giving himself hiccups every time. I didn't have a baby for the baby stage; I love baby cuddles and the sweet smell of a baby's head, but I had a baby so that I could have a kid - a kid who could understand me, and talk to me, and join in with all of my crazy schemes (most of which involve baking something sugary...). And now I feel like I can see that kid starting to come through, and it's so exciting. He's learning so much every day - from patting his head on command to 'celebrating' with us by cheering with his little pudgy arms in the air, to copying the sounds of words (in the very loosest sense of the word - we're a long way off talking!). He went from being a bit useless on the gross motor skills front to doing everything except walking in one month - he's pulling himself up, cruising, sitting up from lying down and proudly parading around when you hold his hands any chance he can get. He amazes me every day, and I am so, so lucky that he's mine. Oh man, this has been the toughest month so far. I was really not prepared for how difficult having a sick baby all the time would be. Throw in going back to work and you've got a recipe for exhaustion and a good few weeping fits. In the past month, Benjamin has had two colds, an ear infection and tonsillitis. He's had two doses of antibiotics and more Calpol than we can count. (Although never above the recommended amount of course). He's slept in our bed more nights than not, and it feels like every time he gets better, going back to nursery gives him more germs. From everything I've heard, this is totally normal and to be expected. But, honestly? This is more difficult than the newborn stage. Which everyone talks about as really hard, so I was prepared for it. I was prepared for the sleepless nights and the hormonal breakdowns and never getting to shower. But, I thought we were over the most difficult hurdles, because no one talks as much about this stage. The stage where you're almost back to sleeping normally, and feeling like you're in a good groove, and then you're thrown right back to the beginning. I am so much more anxious now than I was as a new mother; I am anxious because he's not yet settled at nursery, I am anxious because every night is a toss up of whether we're going to get any decent sleep, and I am anxious because my baby is sick and I can't always do anything to help. And I'm sometimes anxious because I am sick or because Paul is sick, and it is so much more difficult to look after a baby when you feel like death warmed up yourself, but there's not really any other option. But, that's not to say that it has all been doom and gloom. Although he has been so poorly, Ben is such a little trooper and for the most part, I'm not sure you could tell during the days that he's been feeling off his game. He is getting so smart, clapping and waving and playing silly little games with me. He seems to want to skip crawling altogether, and loves to stand and walk with your help. Nursery seems to have triggered a bit of separation anxiety, so he's constantly reaching for me and has learnt to give 'kisses' (which mostly just means licking the whole bottom half of my face). His affection is everything, and I will never be bored of being his favourite person. Who knows how long this stage will last? Both the good and the bad. We're off on a little holiday this week to rest and recuperate, and hopefully steer clear of germs for a short while, and I'm hoping that we can get back to 'normal' after that. I'm also going to use some of my holiday time to plan Ben's birthday party - how did we get here so quickly? So, we made it. Benjamin has now spent as long outside in the world as he did 'on the inside'. These past nine months feel so much quicker and also so much slower than the previous ones. It's been a steep learning curve, that's for sure. This past month has been especially testing, with starting back at work and at nursery, our first trip to A&E and Ben's first proper bout of illness. Although I know that Ben is going to love nursery, and he's already had the opportunity to do so many exciting things, like playing in the sandpit and getting messy with jelly, he's also finding it tricky to settle. He's going through some separation anxiety and doesn't even like me to hand him over to friends whilst I'm in the room, which is a new thing for him. We'll get there, of course, but it's been tough to leave him so upset. On the flip side, he's had so many moments recently where he's just been an absolute dream boat. He is learning constantly, and I'm pretty sure he's a genius baby because he can put all the rings back onto his rainbow stacker. He's learnt how to give 'kisses', in the loosest sense of the word so he's often slobbering all over my chin. He laughs a lot, especially when you undo a roll of sellotape (there goes my genius baby theory...) and he's particularly in love with Paul (his 'fun' parent) and gets so excited when he gets home. Despite all the above, it's also so much easier to parent him now. It might not always be this way, but it feels like every month things get a little bit simpler. We don't need to cart as much stuff around with us all the time, and he can sit up on his own so I can put him down more easily wherever we are. He's getting better at independent play, and he's started taking longer naps in his cot (!!! ), which I thought would never happen and make the days go more quickly. He's my real little pal now, and because I'm at work for three days every week, I look forward to our time together more than ever. I've also started to plan his first birthday party, too... where does the time go?! It's sometimes hard to remember what Benjamin was like as a squishy little newborn, he seems almost like a toddler these days and although it's happened in the blink of an eye, it also seems like the longest stretch of time since he slept all day and fit into the crook of one arm. He's an absolute giant these days - taller than two of our friends' 14 month olds. He's growing out of his 9-12 month clothes already, which is really not ideal as I don't really want to have to buy a full new set of clothes *again* so soon. He's just started sitting on his own in the last week or so, which is a real game changer for him when he's playing. He's eating everything in sight - three full meals a day already, which I wasn't expecting. He's an enthusiastic eater at the moment, and hasn't yet turned his nose up at anything - although I'm sure it's only a matter of time. He's also taken an occasional nap on his own, which is a game changer for *me* in getting things done in the day - let's hope that once or twice turns into (almost) every time, shall we? This coming month is a big one for us; Ben is going to nursery and I'll be going back to work, so we're going to need to learn how to make that work for us. We've had a couple of settling in sessions at nursery, and he seems to have taken to it as well as can be expected, so I'm not too worried about him. He's definitely ready for all of the fun and stimulation at nursery - he gets easily bored with me at home, which I don't think is a risk at nursery! I'm hoping that will also help him sleep better, as we're very much in the dreaded eight month sleep regression right now, which doesn't bode well for me going back to work rested and ready to go! I'll be honest, the nights are getting to me a bit now - it's not even that I am that tired, because in the grand scheme of things he is an okay sleeper, but it is frustrating to be woken, and jarring when it happens at a different time every night. I know this is only going to be a small part of his life, overall, but I'm very much hoping it doesn't last for too much longer. But, for all my moaning, I am totally head over heels in love with him. When he excitedly kicks his legs or gives me a giant grin, or laughs along when I sing his favourite song, it just makes my heart sing. I will sing that damn song on repeat for as long as it makes him giggle. Every time I am getting to the end of my tether, worn down by sleepless nights and endless domestic chores (three meals a day means a whole lot more chores...), he makes me laugh or pulls a particularly cute face, and I can't stay mad at him. I mean, who could? We've now been halfway around the sun together. Can you believe it? I'll be honest, I'm writing these updates more for me than for you, but I hope you get something out of them, too, even if it's just a little smile at the sight of my gorgeous boy's face (yes, I am biased, why do you ask?). As always, six months is my new favourite age. Benjamin is a total dreamboat, full of smiles and giggles. He is so very chilled out, and so very tall (from my calculations, he is almost off the chart) - both of which he gets from his father. He scrunches up his shoulders in the sweetest way when he laughs, and will give you the biggest smile before turning his face away as if he's shy. He's started to have 'favourite' toys and needs far more entertaining - which is in equal parts a lot of fun and completely exhausting when you're flying solo. We're also getting started on weaning, which is in equal parts a lot of fun, anxiety-inducing and completely messy. There are the more difficult times, of course. The nights where he wakes up screaming every half hour, for example. I know a lot of would-be parents worry about the sleep deprivation but we have generally been lucky, so far. It has not been as bad as people told us, but some nights are very, very long. Whilst you worry about coping with your own tiredness before you become a parent, when the time comes you are torn between that frustration of not having enough sleep yourself, and the absolute heart-break of seeing your baby upset or in distress. Parenthood is wild, for so many reasons. Everything is how I imagined it. Nothing is how I imagined it. He surprises me everyday. I have come to realise maybe my most important lesson this month; Benjamin is in charge and I am very much just along for the ride. He is just doing his thing, and I am a grateful, tired, loving witness right now. Going with the flow is the very best thing I can do for both of us, but it is not something that comes naturally to me. Ben is teaching me. He's a good sport like that. So, six months. I am utterly in love. I feel like we've got a good groove together and I am trying to enjoy that as much as possible before he goes to nursery in March. I know that in parenthood, as in life more generally, every time you think you've got a handle on things, the rug is pulled out from underneath you and I think that the transition to nursery is going to be one of our biggest challenges so far.